We try to include mentions of all sorts of stocks from nano-caps all the way up to the big boards, and there can be no doubt we’ve found success with plays across the entire spectrum. Generally, when we catch a stock for a large gain over a short time period, it trades for pennies a share or less. However MULE is yet another example of a higher priced stock that we recently put on our radar, making a series of big jumps in just over a month. The move was catalyzed by yesterday’s announcement that the company would be acquired in full by Salesforce. Generally you don’t get a sustained push from a buyout, so we wouldn’t be surprised if the stock didn’t go much higher, but we’ll keep an eye peeled just in case. We’re going to place AYTU on watch this morning as a potential bottom bounce play. The stock produced abnormally high volume yesterday along with a marginal spike in PPS. 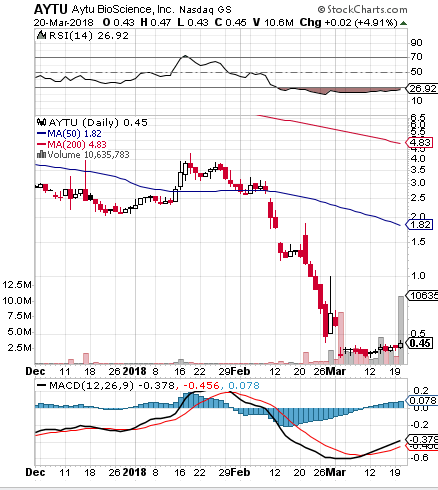 As you can see on the chart below, AYTU saw a precipitous decline in February, and has been oversold all month long, yet still maintaining support in the low to mid .40′s. Indicators suggest the possibility of a recovery on the horizon, so we”ll go ahead and monitor the activity here in the days ahead. General Mills Inc. GIS – General Mills has been in trouble on the chart for quite some time, and despite it already being at 3-year lows, the stock is continuing to get crushed on the heels of a disappointing earnings report. Accordingly, we’re going to be tracking the GIS 04/20 $50-45 Puts. We signaled some options ideas for Boeing on Wednesday morning, the BA Weekly $352.50-360 Calls. We were met with moderate-to-good intraday gains ranging from 74-188%, as we reported yesterday morning. 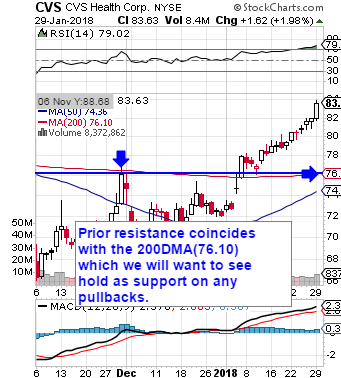 We added ideas for the Mastercard chain as well in yesterday’s premarket report with the MA Weekly $170-175 Calls. Those also turned out to provide the chances for some very nice intraday gains. We were just reporting to our readers yesterday morning on the amazing 400%+ run LFIN made after we highlighted the newly IPO’ed stock on Friday morning. We had observed a run from 7.86 to 26.80, but that pales in comparison to the move it produced to kick off the week yesterday. LFIN opened up just below $40 and saw a low of 35.00 before launching into the biggest single session move we have ever seen from a thirty dollar stock in our entire trading careers. The stock steadily bulled its way up throughout the morning to reach an unbelievable high of 142.82 just prior to Noon Eastern. That works out to an earth-shattering move of 308% on the day, and a mind-bending two-session swing of 1717% over our observed low of 7.86 on Friday. Once again, for a stock in this price range, these are unheard of, once-once-in-a-blue-moon kinds of moves, so congratulations to anyone who acted on our alert Friday! Our successful weekly options calls for UAA from last week turned out great for us as we were mentioning in yesterday’s report, but we weren’t quite ready to focus on the longer -term idea we made with them, the 01/12 $14.50-15.50 Calls. That changed rather quickly, as those ideas began to bear fruit yesterday with another bullish session from UAA. We’ve got some very nice moves so far, including a couple of two-hundred-percenters!